For the first time, two of the most powerful phenomena in the Universe have been clearly linked together in the same system. An eruption from a supermassive black hole has been swept up into the collision between the galaxy clusters Abell 3411 and Abell 3412. The result is an extraordinary acceleration of particles that explains mysterious swirling structures seen in radio data. 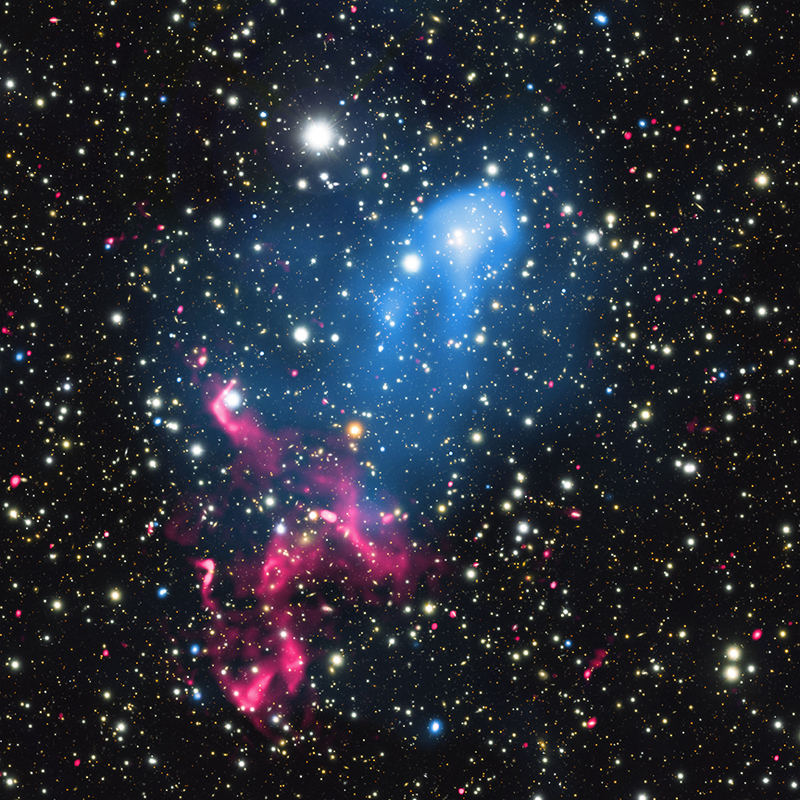 X-rays from Chandra were combined with several other telescopes to make this discovery. Using data from NASA's Chandra X-ray Observatory and several other telescopes, astronomers have discovered a cosmic one-two punch unlike any ever seen in a pair of colliding galaxy clusters called Abell 3411 and Abell 3412. 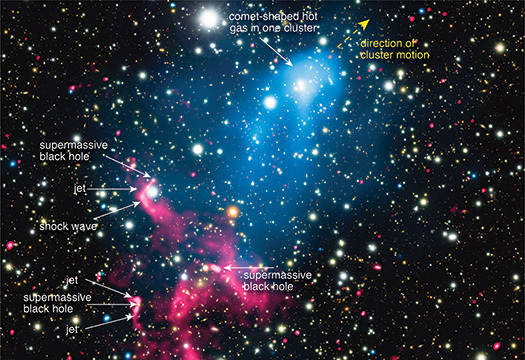 This result, described in our latest press release, shows that an eruption from a supermassive black hole combined with a galaxy cluster merger can create a stupendous cosmic particle accelerator. This spinning, supermassive black hole is producing a rotating, tightly-wound magnetic funnel. The powerful electromagnetic fields associated with this structure have accelerated some of the inflowing gas away from the vicinity of the black hole in the form of an energetic, high-speed jet. Then, these accelerated particles in the jet were accelerated again when they encountered the shock waves from the galaxy cluster collision. Jets from the two other supermassive black holes (see labeled version of image) are likely having the same effect of accelerating particles before they get a second boost from the shock waves. The jets from one of the black holes are too short to be seen in the labeled image. These results were presented at the 229th meeting of the American Astronomical Society meeting in Grapevine, TX. They were also described in a paper, led by Reinout van Weeren of the Harvard-Smithsonian Center for Astrophysics, which appeared in the inaugural issue of the journal Nature Astronomy on January 4, 2017. 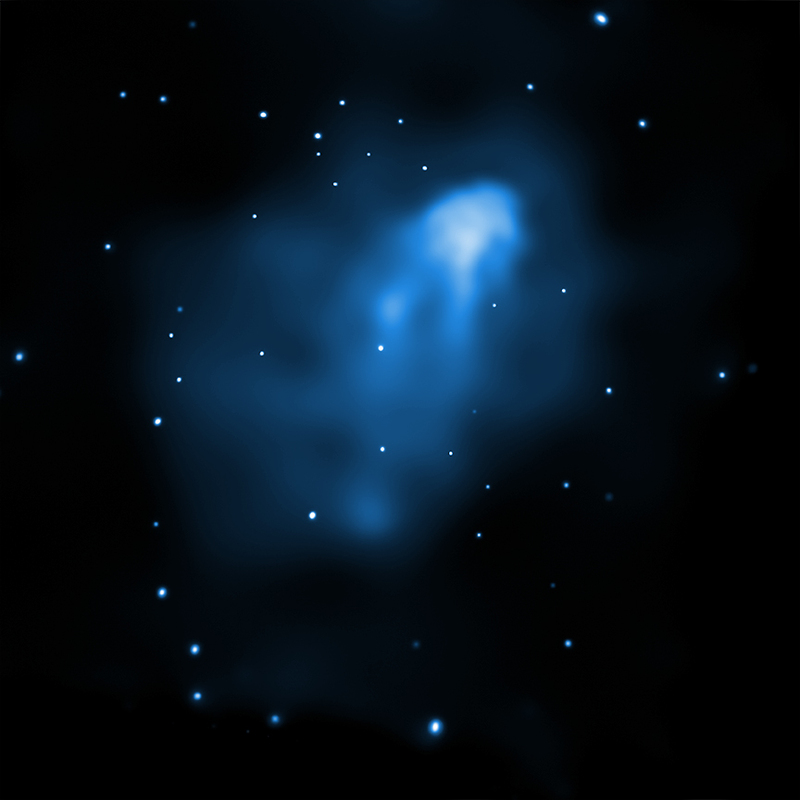 Coordinates (J2000) RA 08h 41m 47.69s | Dec -17° 28´ 45.84"
A pair of colliding galaxy clusters in the constellation Hydra. About 2 billion light years from Earth. About 10 million light years across.